2017. Candidates having required qualifications may apply for this RPEC recruitment vacancies through offline mode. Download the application from the official website www.rajssa.nic.in. Full details regarding this RPEC Application procedure are given in the notification. Eligible applicants have to attend Walk in Interview, conducted by Rajasthan Primary Education Council Selection committee on 07-11-2017. More details and Venue of the interview will be given in the notification. Candidates have to carry the PREC application form and other required documents to the place of Interview. Further details of Rajasthan Primary Education Council RPEC Recruitment 42 Warden, Teacher Jobs Recruitment Method, Walk in Interview Date & Venue, Ag relaxations, Pay Scale, Application Procedure details and other description are mentioned below. Total vacancies available in Rajasthan Primary Education Council Recruitment are 42 posts. Post Name: Warden, Teacher: 42 posts. 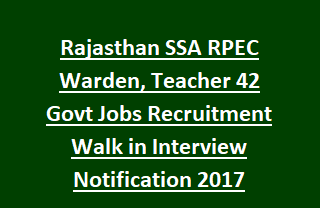 Age of the candidate for this Warden & Teacher Jobs is admissible as per Rajasthan SSA Govt rules. Candidate must have passed 12th class/ Graduation degree from recognized board/ University. Please check the RPEC Notification for further details. Salary for the RPEC Recruitment vacancies is as per Rajasthan Govt norms. Candidates applying for Rajasthan Primary Education Council Recruitment vacancies need to attend Walk in Interview conducted by RPEC selection committee. Please visit RPEC Official website for more updates. Aspirants have to visit the official web portal of Rajasthan Sarva Shiksha Abhiyan www.rajssa.nic.in. Read the instruction carefully to fill the application form for the vacancies of Warden, Teacher Jobs. Interested candidates have to attend the Walk in Interview which will be held on 07-11-2017. Properly filled application with attested copies of documents must have to carry at the time of Interview. Venue of the Interview will be mentioned in the notification.